3 vols., 492, ?, ? 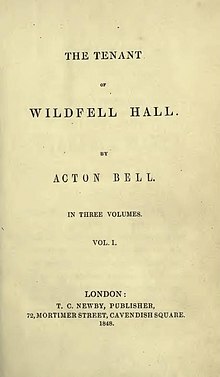 The Tenant of Wildfell Hall is the second and final novel by English author Anne Brontë, published in 1848 under the false name Acton Bell. Story framed as a letter from Gilbert Markham to his friend and brother-in-law. He writes about events leading to his meeting his wife. It is a classic of English literature. Gilbert writes about a young woman, Helen Graham, who arrives at the old house, named Wildfell Hall with her small son and a servant. She doesn't want to talk about her life with her new neighbours, so they decided that she did something wrong in her past. No one, except Gilbert, his sister Rose and Mary Millward, her friend, believes that she is a good woman. Someone thinks that she has an affair with Frederick Lawrence (who is actually her brother). When Gilbert, already fallen in love with Helen, begins to believe that she is a bad woman, she gives him her diary. In her diary she writes about her live with her husband, Arthur Huntingdon, who drinks a lot of alcohol and behaves himself badly. When he begins to make their son, also Arthur, alcoholic and teaches him to say bad words, Helen decides to run away from him. After many troubles she secretly comes to live at Wildfell Hall. Helen leaves that place, when she learns that her husband is ill. She takes care of him, but he all the same died. After some time Helen and Gilbert marry. They lead a happy life and have at least two children together.